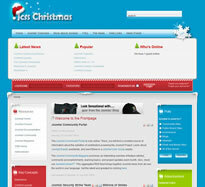 The CSS guys have released a festive number that is, well, is festive. I'm all for festive themes but a bit like Google I pick mine - simply because there are so many you could always be changing your website theme. If I didn't make it clear, this is a Christmas theme for Joomla and you don't have long to use it, however you can put it up every year. Still, that is purely personal preference and you might be looking for a theme right now that has a Christmas feel and if you are, then this one could quite possibly be for you. It has loads of module positions, fourteen to be exact, it's a tableless design and only available for Joomla 1.5. For more infortmation, a demo or anything else, click here.